A decade ago online automated investment services known as robo-advisors appeared on the financial planning landscape. This technology powered by AI and algorithms was leveraged by a handful of innovative fintech (financial technology) companies and has expanded to include some of the more well known investment firms. This white paper is a case study on robo-advisors and their impact on the wealth management industry. Lower barrier to entry.Most financial advisors require a minimum investment of $500,000 or more to open an account. Robo-advisors have lower minimum investment requirements with some account minimums as low as zero. Lower fees. Robo-advisors charge less for their services, with management fees at about 0.25% of assets, compared to the annual fee of at least 1% ($1 for every $100 invested) of traditional financial advisors. They build portfolios using low cost index mutual funds or ETFs (exchange traded funds that usually track a benchmark index like the S&P 500). Automation. Robo-advisor solutions really shine when it comes to ongoing automated tasks such as portfolio rebalancing and tax loss harvesting. Accessibility/Transparency. Signing up is easy and the service is available 24x7 with user-friendly online financial tools and powerful analytics software. Instead of an initial consultation with a human financial advisor, robo-advisors conduct business online through their website. You will typically be guided through an online questionnaire to determine risk tolerance, financial goals and investment time horizon. Then this information is put through proprietary AI algorithms and Big Data number crunching to determine a best asset allocation for your investment portfolio. Next you will receive a financial plan that describes the optimal asset allocation customized for you. The recommendations are usually for low cost index mutual funds or ETFs. Their strategy is not to beat the market but to deliver returns that most closely match the market. Once you deposit the funds into the new account, the robo-advisor will implement your financial plan and purchase the recommended funds for you. The algorithms used by these robo-advisor companies are proprietary, but most robo-advisors use Modern Portfolio Theory in their calculations. 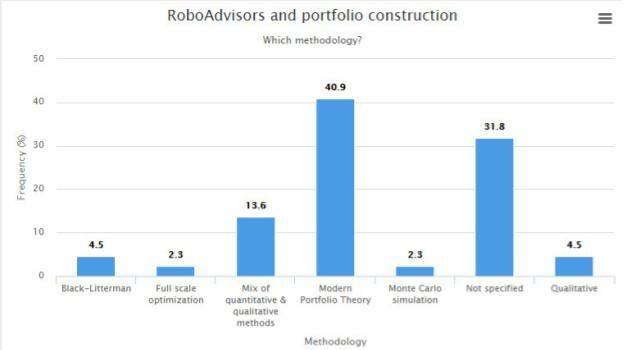 Raffaele Zenti collected data from around 50 robo-advisors and summarized his findings in the following chart taken from his LinkedIn blog post. While anyone who invests is a potential robo-advisor customer, the current robo-advisor market mostly targets younger investors who are in their 20s and 30s - millennials. Many are investing for the first time, have a lower net worth than those nearing retirement, and have been raised on technology. They also may not reach the minimum investment requirements necessary for a human financial advisor, so an affordable, software-only financial service is tailor-made for them. Initially robo-advisors were seen as a threat to replace the human financial advisor since they offer a competing service for a lower fee. Traditional financial advisors (the big investment firms as well as the independent Registered Investment Advisors) defended their high fees by pointing out how their financial services are more comprehensive than those offered by a robo-advisor. That defensive posture may have worked for a while, but eventually the traditional financial advisors had to adapt. In the spirit of you-can't-beat-them-so-join-them, a new hybrid model spun off from robo-advisors where investment firms developed their own robo-advisor technology and integrated it into their portfolio management services. Vanguard has been the most successful at leveraging this hybrid human-robo integration. They have an army of Certified Financial Planners (CFPs) who use robo-advisor technology to manage accounts. In just a few years since it was launched, Vanguard Personal Advisor Services has become the 800 pound gorilla in this arena with over $100 billion in managed accounts. Not every investment firm has the resources to develop robo-advisor technology in-house, so other fintech companies have stepped in with robo-advisor services called Digital Advice Platforms to support human advisors. Jemstep, which started out as a Business-To-Consumer (B2C) robo-advisor has pivoted to Business-To-Business (B2B) with their Advisor Pro platform. In 2014 Betterment launched their Betterment for Advisors platform. These platforms allow Registered Investment Advisors (RIAs) to operate more efficiently and possibly expand their client base to include lower net-worth clients. Conversely, some robo-advisors are adding human advisors to their services, possibly reacting to the entrance of industry giants Vanguard and Schwab into this market. Betterment, a robo-advisor pioneer, began offering its own hybrid solution in 2017 with Betterment Plus and Premium services. Many of the early robo-advisors such a Wealthfront and Betterment are still around and thriving. Some robo-advisors like Hedgeable didn't survive the hyper-competitive marketplace while others were bought out by established investment companies. Northwest Mutual took over LearnVest and shut down the robo-advisor. The insurance company said in a statement that they plan to relaunch Learnvest.com in late 2018 as a financial education site. How long will Wealthfront and Betterment remain independent? As long as venture capitalists continue to fund them, they will continue to survive. Wealthfront just got $75 Million in their latest round of funding in January 2018 while Betterment got $70 Million in 2017. There are risks and limitations the come with using a robo-advisor. Robo-advisors tools are usually configured with limited options. For example, you will only get Vanguard mutual funds when you use Vanguard's service. Online questionnaires may not be personalized enough to adequately assess financial tolerance, which might result in an asset allocation that is not right for the client. There is also operational risk that a robo-advisor could shut down its service, as in the case of Hedgeable and LearnVest. Investors should also beware of any robo-advisor that promises better portfolio performance or strays from its core investment principals. For example, Personal Capital promises to beat the market by using tactical weighting in their domestic stocks, which takes on the additional risk of increased exposure to small-cap stocks through equal sector weighting. In February 2018, Wealthfront began automatically enrolling some customers into their own fund that resembles a strategy used by hedge funds. Felix Salmon writes on Wired.com: "Instead of putting investors solely into a low-cost indexing strategy, Wealthfront has now decided to invest 20% of its investors' funds into an internal "risk parity" fund, which in turn is invested mostly in complex derivatives known as total return swaps. The fees associated with the old strategy averaged out at 0.09%; the new strategy, by contrast, carries a fixed fee of 0.50%, all of which goes directly to Wealthfront, plus the costs associated with buying the swaps." Changing strategy increases the risk of underperforming the overall stock market. In Wealthfront's case there was also an increase in cost through higher fees, even though they did eventually cut the expense ratio of the new fund down to 0.25% after customers complained. Finally, robo-advisors are still untested in real world market challenges. They have operated in the past few years under generally calm market conditions, and we have yet to see how they would perform under more volatile market conditions, economic downturns and recessions. Robo-advisors typically rebalance portfolios and take advantage of tax loss harvesting in declining markets, but is this enough to protect investors from significant losses? Technological innovation will continue to drive this industry with more of a focus on AI and self-learning algorithms. Adam Nash, the CEO of Wealthfront, told WealthManagement.com, "We are entering the realm of building our platform for the future. [We have] a huge opportunity to deliver financial advice that is deeply personalized and relevant while getting a platform in place for AI's increasing role." The hybrid model, where robo-advisor technology is paired up with advice from a Certified Financial Planner, will continue to grow. Personal Capital, which uses the hybrid model, has managed to compete with Vanguard using the freemium business model. They offer a free financial budgeting and investment management tool to anyone who signs up and links their financial accounts. Within days of signing up you will receive a phone call from someone at the company inviting you to participate in a free consultation with one of their financial advisors. Finding new clients is tough for any wealth management firm, but Personal Capital has tapped into a ready-made potential customer base who already use their free personal finance tool. One major test the robo-advisors have yet to face is how they will survive a bear market. When investors feel that their advisor can no longer protect their assets in a bear market, they will vote with their feet. How many clients will cancel their accounts out of frustration? A human advisor might be able to convince someone to stay the course, but what can a robo-advisor do to regain the trust of a client after he or she experiences a financial meltdown? We also do not know how robo-advisors perform in the long term since they have only been around for 10 years. It would be nice if someone eventually did a longitudinal study comparing the performance from various robo-advisors and human advisors along with a control group investing in a target date retirement index fund. Some people have predicted the death of robo-advisors since the first one was launched in 2008. Robo-advisors have not only survived but also thrived, yet how have they added value? Robo-advisors provide an affordable low-cost service for those who just don't want to be bothered with do-it-yourself retirement planning and would prefer to use their time for other pursuits. Having a financial plan and sticking with it through bull and bear markets can improve investment returns, and robo-advisors are very good at executing financial plans as well as monitoring and tweaking portfolios through automated rebalancing and tax loss harvesting. Robo-advisors also won't make unnecessary trades that deviate from the client's plan, won't try to time or beat the market, and won't put you into expensive actively managed mutual funds or ETFs. The disruption caused by robo-advisors has divided the wealth management industry into two sub-markets. Robo-advisors now serve the lower end clients with basic portfolio management, and traditional advisors continue to serve the more sophisticated higher end clients with more comprehensive financial planning services. The disruption has also been a wake up call for the wealth management industry to step up their performance with new innovations such as the hybrid model. Human advisors who augment robo-advisor technology benefit from offering a service that combines the best of both worlds. The wealth management industry also benefits from the technical innovations coming from new fintech companies as well as established companies rolling out their own versions of robo-advisors. There is a saying that a rising tide lifts all boats, and we have just reached high tide in this underserved market. Arvedlund, E. Vanguard’s hybrid robo-advisor creates amazon-like fear among competitors; bogleheads say robo can be great training. http://www.philly.com/philly/business/vanguard-hybrid-robo-advisor-pas-bogleheads-training-amazon-20180514.html?arc404=true, May 2018. Berger, R. Dr 136: 5 reasons robo advisors are worth the cost. https://www.doughroller.net/investing/5-reasons-robo-advisors-are-worth-the-cost/, Aug 2018. How robo-advisors are disrupting the wealth management industry. https://medium.com/@ehvLINC/how-robo-advisors-are-disrupting-the-wealth-management-industry-7dd4b532a224, Mar 2018. Taking robo-advisors to the next level: Personalizing the investment experience with goal-based investing. https://www-01.ibm.com/common/ssi/cgi-bin/ssialias?htmlfid=ASW12411USEN, 2016. Robo advisors and the business of automated advice. https://digit.hbs.org/submission/robo-advisors-and-the-business-of-automated-advice, Apr 2018. Neal, R. W. Wealthfront turns to artificial intelligence to improve robo advice. https://www.wealthmanagement.com/technology/wealthfront-turns-artificial-intelligence-improve-robo-advice , Mar 2016. Neal, R. W. Betterment pivots toward a human-robo hybrid. https://www.wealthmanagement.com/technology/betterment-pivots-toward-human-robo-hybrid, Jan 2017. Salmon, F. Beware of roboadvisors bearing low fees. https://www.wired.com/story/beware-roboadvisors-wealthfront-betterment/, Mar 2018. Verhage, J., and Burger, D. Wealthfront cuts fees on risk parity fund after user backlash. https://www.bloomberg.com/news/articles/2018-04-18/wealthfront-cuts-fees-on-risk-parity-fund-after-user-backlash , Apr 2018. Wealthfront. Wealthfront investment methodology white paper. https://research.wealthfront.com/whitepapers/investment-methodology/, 2018. Wharton. The rise of the robo-advisor: How fintech is disrupting retirement. http://knowledge.wharton.upenn.edu/article/rise-robo-advisor-fintech-disrupting-retirement/, Jun 2018. Wong, M. The evolution of robo-advisors. https://www.morningstar.com/blog/2018/07/11/robo-advisors.html, Jul 2018. Zenti, R. Roboadvisors like a commodore VIC20? apparently, according to this quick survey... https://www.linkedin.com/pulse/roboadvisors-like-commodore-vic20-apparently-according-raffaele-zenti/?trk=mp-reader-card , May 2016.